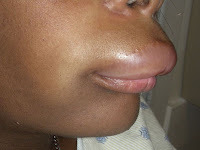 Angioedema is a swelling that is similar to hives, but the swelling is under the skin instead of on the surface. The Food Allergy and Anaphylaxis Emergency Care Plan by FARE is available here. Click here for En Español. Angioedema (AE) - Different Causes. Click here to enlarge the image. Different causes of mast cell-related angioedema. Click here to enlarge the image. Different causes of angioedema with unknown mechanism. Click here to enlarge the image. Conditions that may resemble angioedema. Click here to enlarge the image. There are different causes for angioedema that can be remember by the mnemonic "INHALED": 6 causes: 5 non-allergic+1 allergic. Click here to enlarge the image. Diagnosis of Chronic Urticaria and Angioedema (click to enlarge the image).